If you’ve even following my blog for a while. You know that Black Friday is one of my favorite shopping times. For many years, the Mister, and I would travel to our favorite outlet to complete all of our shopping, and stop at Target in route back home. So many wonderful memories! There are a ton of stores that have Black Friday sales, which stores do you plan on visiting online, and in person? I’ve found it so helpful to create a list of the stores in which I plan on visiting in person, and virtually, and what item I want from each store. Know who you’re shopping for and what stores you would like to shop at for that person. It’s so easy to see all of the sales and add everything into your cart. Creating a shopping list makes it so much easier to have a strategic plan. I’m all for budgets, it’s so easy to overspend on Black Friday on items that you don’t even need or want. Create a budget for each person on your shopping list. If you’re purchasing items for yourself or Home. Create a budget for the store in which you plan on shopping at. As the saying goes, “if you fail to plan, you plan to fail. “ Of course nothing is glowing to be perfect. Stores will sell out of items, some stores might not even have the item in stock in which you’re looking for. I highly suggest purchasing the items that are on sale for the same price online. That you purchase the item online to avoid having to search around the stores looking for it. Do you have any Black Friday Tips? I went out for some Black Friday shopping once and it was also my last. I don't do well in crowds, so I usually skip it all together. I have found that most people shop for themselves not for other people on black friday. Having a budget is very important. My biggest Black Friday tip is to shop from home. I have found excellent Black Friday deals online, and it keeps me from having to deal with the crazed, frothing masses in the store. 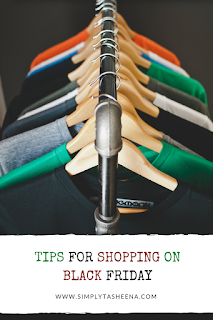 Great tips girl and yes a budget is absolutely imperative to have for Black Friday shopping! These are some great tips, I think so many people buy things just because they seem like bargains but then never use them?! Meaning it definitely wasn't a bargain at all! I generally shop online to avoid the crowds. Sometimes you can even find better discount codes! I have shopped in store in the past, and the people and the fact that things sell out quickly make it not worth it to me. I have shopped on Black Friday more than once and I am pretty sure people are a bit crazy that day LOL. I would like to go again just because it's interesting and I do save a good amount of money. I like these tips. So we are Canadian and Black Friday isn't as big a deal here and it is always sort of staggered because our Thanksgiving is so much earlier. But what I do enjoy doing is buying things on line and having them delivered because it is so much easier! My husband and I went Black Friday shopping when we were first married. Now we skip the lines and shop online if we shop at all! I can not believe it is a few weeks away and the unoficial start of Chritmas shopping. I have to use some of these tip for when I shop this season. My tip would be to ... NOT DO IT? Lol! No no, I would just SHOP ON LINE!!! I can't deal with crowds and what-not! YIKES! These are great tips! Budget is definitely number one haha....it's easy to go crazy this time of year! These are great tips for those who shop on Black Friday. I spend the day decorating my church for Christmas and if I have a little time left over, I may go online and do a little shopping. I used to love Black Friday until stores started opening on Thanksgiving night. Thankfully, many of the same deals are also available online, so I now shop from home. Budgeting is such an important thing for Black Friday. If you can't afford it, it doesn't matter how much of a good deal it is. Black Friday seems to have lots it's spark now since stores are open and starting on Thanksgiving. We still go out on Friday. But it's not as congested with shoppers like it once was. Kinda sad actually. But great tips, you can still get carried away! Shopping is always fun, but on occasions one tends to get carried away and go overboard. Your suggestion about sticking to a budget is very prudent. This will help to know when to call a stop. I love shopping on Black Friday! All the great deals make my heart go pitter patter! Thanks for sharing your tips to my this Black Friday the best yet! Black Friday is one of my favorite days of the year! It used to be middle of the night shopping sprees and mad dashes. Now it's a lot more planning and research. These are great tips to stay on budget and making your shopping really productive.